Along with moving into the functional and attractive, $32 million addition to Brown Hall, the Division of Engineering underwent a major reorganization this year. Division of Engineering students returned to campus this August to some big architectural changes, not only to the bricks and mortar, but also to the division itself. As expected, the 78,000-square-foot addition to Brown Hall had been completed; but along with the new configuration of the building, their division had been reorganized into Colorado School of Mines’ first college. It’s mostly coincidental that both happened at the same time, linked only by the fact that both changes are long overdue, says Terry Parker, executive vice president and provost, who came to the position in January, having chaired the Division of Engineering since 2006. He explains that after almost three decades of growth, the division was chronically overcrowded, with more than one-third of all Mines students enrolled in programs administered by the division. In addition to running out of space, the administrative burden of leading the program had become overwhelming. Along with the former Division of Engineering, the yet-to-be-named college comprises the former Division of Environmental Science and Engineering, and the former Department of Mathematical and Computer Sciences. The three units have been organized into four departments: Mechanical Engineering, Electrical Engineering and Computer Sciences, Civil and Environmental Engineering, and Applied Mathematics and Statistics. With department heads in place to manage each of these units, the difference from Moore’s point of view is significant, although the administrative reorganization has little immediate impact on students. Eventually, however, the names of undergraduate engineering degrees will be changed to be more discipline-specific. Currently, undergraduates earn a bachelor of science in ‘general engineering,’ with civil, electrical, environmental or mechanical ‘specialties,’ or a degree in ‘mathematical and computer sciences’ with a concentration in applied computer sciences, computational and applied mathematics, or statistics. In the future, students will graduate with a BS in civil, electrical, environmental, or mechanical engineering, a BS in computer science, or a BS in applied mathematics and statistics. While this sounds like a big shift, it won’t require major curriculum changes, Moore explains. Degrees will simply bear a name that more accurately characterizes coursework already in place for the existing degrees. But it’s something students have been requesting for years, and faculty in the college are happy they may soon be able to confer degrees that align more closely with mainstream practice and the expectations of industry. Another goal of the reorganization is to provide administrators with the ability to strengthen their programs strategically over time. “Many of our current students in the college came here because it’s Mines’ the best university for technically oriented students in Colorado,” says Moore. “They decided what to study after they arrived. In five or 10 years, we’d like to see more students here because of a reputation for excellence in our engineering disciplines. The college structure helps us to move forward strategically to achieve that in ways that were impossible before.” Moore adds that, right out of the gate, the newly formed Civil and Environmental Engineering Department is likely to be nationally ranked among the top-20 programs. Discussions about restructuring the Division of Engineering actually began in 2002. Since then, initiatives have included several proposals by the division, a reorganization task force and a faculty senate committee. When Terry Parker, who knew from personal experience how urgent the situation had become, took over as provost in January, President Bill Scoggins and the Mines executive leadership were in support of the change, and the pathway had, to some extent, been cleared. The college was officially formed seven months later on August 3, when Moore was appointed interim dean. Wanting to hear more about the creation of the new college from Parker, who’s made it his top priority since his appointment, we visited with him one day in early September. He had just returned from a meeting with human resources, attending to one of the hundreds of steps involved in forming the college. During our conversation, we asked him to explain why the college needed to be formed, what it means for today’s and tomorrow’s students, and how it can help Mines become more competitive in the future. Mines: Clearly, this is a significant change in the school’s structure. Can you give some background to the decision? Parker: If I dial back several decades to, say 1970, Mines supported 33 degrees. We had about 1,800 students on campus in nine degree-granting departments. Back then, Mines was the premiere extractive earth sciences school. Graduates went off into those industries, and a degree from Mines was kind of a gold certificate. The Division of Engineering was created after these industries crashed in the 1980s and campus enrollment started to drop off. Since then, the student body has broadened its focus and grown. Today, we have about 5,000 students and, before August 3, 13 degree-granting units supporting 60 degrees. A large proportion of this growth has been concentrated in the Division of Engineering, which was more than one-third of campus prior to the creation of the college. Mines: What are the key drivers for creating the college? Parker: We’ve been unbelievably successful with our recruiting in recent years, with dramatic increases in our admissions metrics. This year’s incoming class is the most academically prepared we’ve seen in decades, and it’s the most diverse, with 40% coming from outside Colorado, and higher numbers of women and minorities than ever before. We obviously want to sustain this kind of momentum, but to continue to compete for students around the country when we have an organization that doesn’t look like any other school is hard. The engineering division offers a general engineering degree with specialty. There’s no other school in the country that has that construct, that accreditation, and also offers an MS and a PhD. We need to position ourselves for degrees that are more strongly in demand. Students, employers and peer institutions all view us through a lens of civil, electrical, mechanical, and environmental engineering, and that’s what we need to deliver to them. Our mathematical and computer sciences degree similarly needs to evolve to the applied mathematics and statistics degree and the computer science degree. Before the reorganization, we had 13 departments sitting around the Academic Affairs table. With 13 units going in 13 different directions, there is no capacity to be strategic. In addition, we need to maintain cross-disciplinary efforts that have been present for a couple of decades in the engineering division. They’re part of the quality that our employers have come to expect. The way to maintain them is through a college and a dean. If we didn’t have to worry about being competitive, then we would have no strong driver to change. But we do. Our students expect an extraordinarily valuable degree. Mines: What are the short-and long-term effects of this realignment? Parker: In the short term, we have changed the academic structure that supports our degrees, but our degrees remain the same. In the long term, with timing yet to be determined, we will have a degree structure that is more in line with national norms. We’re not creating a new focus and going off in a new direction. We’re already there. We’re just adjusting our degrees to represent who we are, and adjusting the administrative structure to a more sustainable model. Mines: What was the process for creating the college? Parker: In March 2011, we went to the department heads in the affected units with the proposed changes and asked them to respond with their critique, including input from their faculty. In May, we went back to the department heads and asked if there were any other showstoppers, and there weren’t. The reason we were able to get it done so quickly, about six months, is that there’s broad recognition within the faculty of those units that it’s overdue. Mines: What concern have you heard the most? Parker: The department heads have expressed worries about the asymmetry in structure. You now have 10 units that are not part of the college and four units that are, so they question how they can compete for resources. However, although the creation of the college puts a formal asymmetry in place, it’s been this way for a good decade, and we simply haven’t responded to it. Mines: Some of our readers might wonder if this means their department is going to get less money at the end of the day. Parker: We didn’t fund the college by taking anything away from departments that are not a part of the reorganization; however, we did collect the budgets from the departments in the college and redistribute them. We have also asked the departments that were not reorganized to consider using some of their operating budgets in a collaborative manner, and in the coming years, we will respond to the strong faculty needs within the college by supporting new hires to the college. We all benefit from a stronger campus. A stronger portfolio of mainstream engineering programs has derivatives that bleed off into other units. 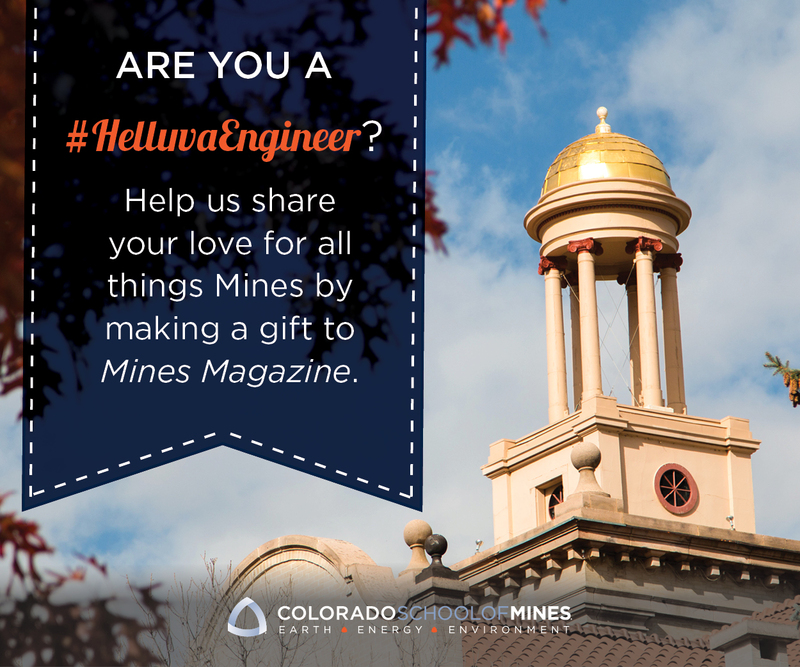 Mines: We have to mention it: Moving into the position of provost having led the engineering division for so long, the criticism might be raised that you’re favoring engineering. Parker: The criticism has been raised. One of the things I’m trying to do is move to data-driven resource allocation. Think of it this way: If we are heavily resourcing a department with a low undergraduate-student-to-faculty ratio, we better understand that we’re doing it and make peace with why we’re doing it. That department could have a large research volume that brings us stature. But a different unit with the same ratio that is resourced in a similar way without bringing stature may need to be reprogrammed a bit. Bottom line is, the data needs to reflect a return on investment. Mines: Everyone wants to know: What will be the name of the new college? Parker: In a school that included an English department, an arts department, and so on, this would just be the College of Engineering, but with so many specialized engineering departments outside the college that obviously doesn’t work. So we are in the midst of a campus discussion. I have formally asked the interim dean, Kevin Moore, for three recommendations from the college, and I will put those names in front of the faculty senate for a recommendation. Mines: What are your immediate next steps? Parker: One of the key aspects of implementing a structure like this is ensuring you have the leadership in place. We anticipate making at least two appointments for department heads soon, and we have an internal process under way to name the dean. Mines: What do you see ahead for the departments outside of this new college? Parker: We need to get the college up and running and operating smoothly, and find out what lessons are to be learned. Then, if it’s appropriate, and we think there’s the appetite on the campus, we can start discussions about creating additional colleges. In 1976, a $4.4 million gift from The Brown Foundation funded the construction of Brown Hall to house the newly established engineering program. By 2002, the Division of Engineering had grown to comprise one-third of the campus undergraduate population, and a proposal was submitted to the foundation for funding a $10 million, 38,800-square-foot addition to handle swelling student needs. When this proposal was denied and state funding for the construction was reduced from $8.7 million to $6.7 million due to the FY 2008-2009 economic downturn, students voted to increase fees, which paid for the majority of the addition. Brown Hall addition and Maple Hall are the first LEED-certified buildings on campus. What’s inside: an auditorium, three classrooms, six seminar rooms, 12 laboratories, seven graduate and 28 faculty offices, senior design space, 10 study rooms, a machine shop, a wood shop, a video conferencing room, and a Starbucks kiosk. Just to be clear, the “college” is a unit of Colorado School of Mines. In no way does this mean the school’s name is about to be changed. And as an update, since this story was published the college has been officially named the College of Engineering and Computational Sciences. Similar concerns as James Molden, what is the driving force behind leaving the “Colorado School of Mines” name? It’s recognized everywhere. Will the school name “Mines” slowly fade away – “stratigically over time” ? Hopefully not.